I have a secret to share: I’ve always been a little intimidated by Evernote. So when I heard that this note-taking and Web clipping app was adding even more features, like Work Chat and Context, which displays content related to your current selection, I was a little worried. Evernote already does so much—would these new feature overwhelm me even more? As it turns out, no. Evernote’s newest features make this app even more useful, especially in the mobile version, though they do require you to invest a bit of time learning how to use them. The same is true of Evernote in general. This note-taking and all-around organizing app is packed with features, allowing you to create and save voice and text notes, photos, and Web clips in notebooks to help you stay organized. All of your notes can be annotated and shared, which makes Evernote a useful collaboration tool. Web clipping has finally gone mobile, though its more limited here than on the desktop. 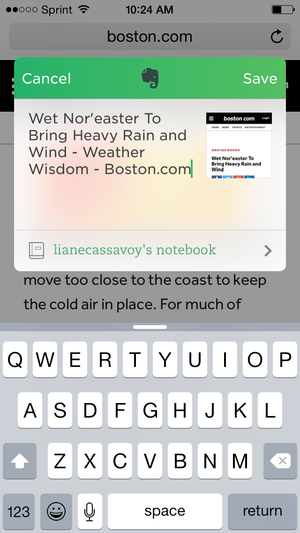 Evernote’s mobile app is just as useful as its desktop companion, albeit in a different way. It allows you to snap photos while on the go and jot notes as you commute. It includes excellent search tools that make it easy to find what you’re looking for. But the mobile app has never succeeded at one of Evernote’s key features–Web clipping–until now. To take advantage of mobile clipping, you’ll need an Android or iOS 8 device. With Evernote installed, you can save Web pages, photos, documents, PDFs, and more to Evernote using the share option. Tap the icon, and Evernote will appear as one of the options (you may have to enable it if it’s not already). Web clipping on mobile isn’t quite as refined as you’ll experience on your desktop, where you can opt to save all of a Web page, or certain parts of it. Using the iOS app, it’s all or nothing when it comes to clipping Web pages and documents. You can select which notebook to save the item to, but you can’t add tags or remarks when saving it, as you can when using the desktop version. You can annotate your notes using the mobile app, much the same way you can using Evernote on your desktop. Doing so on the small screen of a smartphone feels very restrictive. Still, it’s a useful feature when you’re on the go, and you want to jot a note on a photo you’ve snapped, for instance. Evernote Mobile syncs immediately with the desktop version and vice versa, so you can always find your notes, no matter which version you’re using. Evernote’s Work Chat lets you collaborate without exiting the app. Evernote has always allowed you to share notes and notebooks via email, but the app has taken collaboration a step further with its new Work Chat feature. Available on desktop and mobile versions of Evernote, Work Chat allows you to share notes and notebooks, or simply exchange text-based messages with single users or groups. Work Chat is nicely laid out in the mobile version, with easily identifiable icons visible when you’ve viewing notes and notebooks. 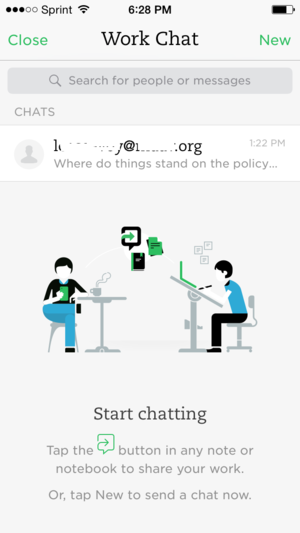 Clicking it takes you to the main Work Chat interface, which you can also access from Evernote Mobile’s homepage. Before testing it, I was worried that Work Chat wouldn’t work well on a smartphone screen, where space is limited. But I was pleasantly surprised with how roomy Work Chat actually felt when using it on an iPhone. Messages were easy to type and read, and the ability to message within Evernote–rather than exiting the app to send a text message or email–streamlines communication and collaborating nicely. The Context feature displays related links at the bottom of your notes, without intruding on your own information. Evernote has always been a great tool for organizing all of the content you find and create. 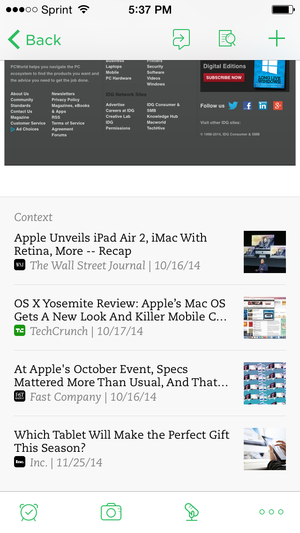 Now, it also helps you find more content with a new feature called Context. Available to Premium users ($5 per month or $45 per year), Context is available on the Mac, iPad and iPhone apps and is coming soon to the Windows and Android apps. Context does just what its name suggests: It adds context to the information you’ve created. When you’re viewing, creating, or collecting information in Evernote, the app searches partner sites for additional relevant information. Those sites include news sources like the Wall Street Journal, Fast Company, Inc., and TechCrunch. In addition, it also can display profiles from LinkedIn when a person’s name is listed in a note. I was impressed with how subtly Context is integrated into Evernote’s iPhone app. The relevant links appeared in small fields across the bottom of my existing notes, and I had to scroll down to see them. I liked that it was my choice whether to view them, and I especially liked that they didn’t take any screen real estate away from the notes I was viewing. The information displayed wasn’t always useful to me, but the articles were relevant to the topics in my notes. 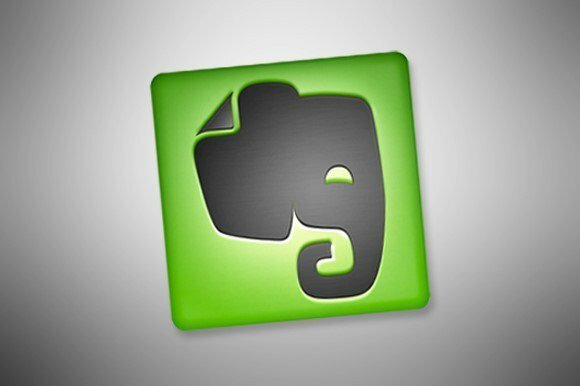 Evernote has managed to add several key features to its desktop and mobile apps, without losing its focus. It remains the note-taking, Web-clipping, and organizing app to beat, especially when you’re on the go. And while it may be intimidating at first, once you dive right in and learn what it’s all about, you may soon wonder how you ever lived without Evernote.